Planning on trading the NFP report tomorrow? Make sure you’re well-prepared! Here are some points you should consider. Tomorrow at 12:30 pm GMT, the U.S. Bureau of Labor Statistics will release the non-farm payrolls (NFP) report. Unless you’re a new kid in the forex trading block, you should know that the NFP report is one of the most closely watched releases in the industry. Employment is a reliable meter for economic growth, you see. And the U.S. is the largest economy in the world! This month is particularly important for investors as it promises to show the underlying trend in employment growth. Remember that last month’s release was heavily influenced by weather conditions. The data only came in at 115,000 in April vs. 170,000 expected as many companies finished their hiring in the unusually warm winter months instead of the usual spring hiring season. This time around market geeks are expecting the headline figure to come in at 150,000 as the payback on spring hiring irregularity is exhausted. In addition, the unemployment rate is expected to stay at 8.1%, while upward revisions in last month’s release are also expected. How exactly do we trade this beast of a report? We all have different styles, of course. But for those who don’t have a strategy just yet, I’ve used a trading framework and a couple of charts to help mark out key support and resistance levels. EUR/USD stuck within a tight range for the better part of the Tokyo and London sessions, not trading more than 15 pips away from its daily open price. 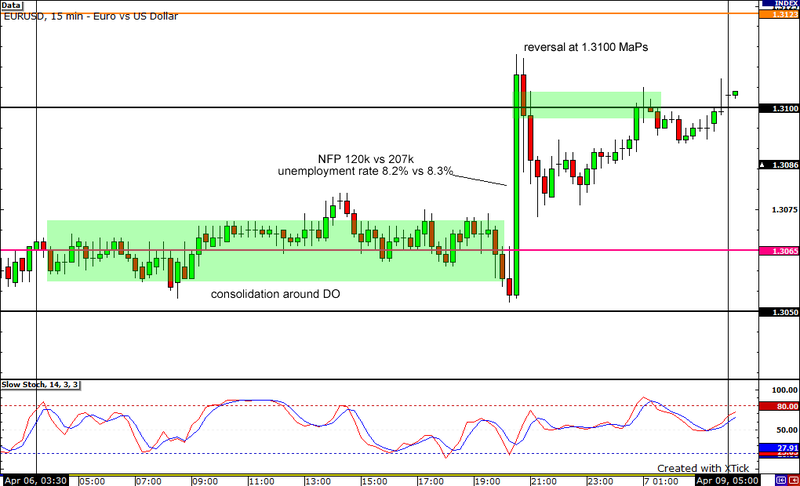 Apparently, everyone was just waiting for the NFP release, as this caused the pair to break out. After breaking to the top on a worse-than-expected result, EUR/USD stalled at the 1.3100 psychological handle. The dollar sold-off immediately after the release, as the report came in much worse-than-expected. However, the pair reversed during the latter part of the New York session, as risk aversion took over the markets, helping the Greenback erase its losses. Based on the past couple of releases, I have three potential strategies that you can try out this NFP Friday. Again, remember that these are just tips! Trade management still plays a huge role in winning or losing trades. Read our risk disclosure! EUR/USD normally consolidates into a tight range during the Tokyo and London sessions. You can play the break, set a tight stop and just aim for the next major support or resistance level. 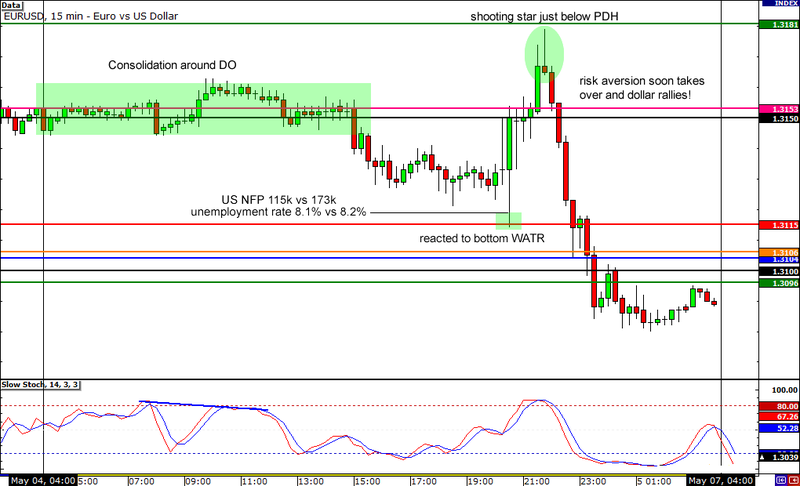 Just make sure to close your trade before the NFP release! You can try a straddle trade and place buy / sell orders above or below the current price. The release of the NFP report normally leads to a strong one-directional move, at least for the first hour or so. I’m warning you though, this strategy is highly dangerous, especially when trading the NFP. It is NOT for beginners. Lastly, you can take a directional bias and load up on long dollar position. Given the current sentiment, the markets are very prone to sell-off when bad data comes out. Even when the dollar sold off immediately after last month’s release, risk aversion eventually took over and the dollar recovered. If we see a worse-than-expected figure tomorrow, we might just see similar price action! That’s all I’ve got folks! Good luck trading the NFP release! If you feel that it’s too hot to handle, there’s no shame in sitting back and letting everything play out before deciding what to do! Having no position is a position! Will you trade the NFP report?